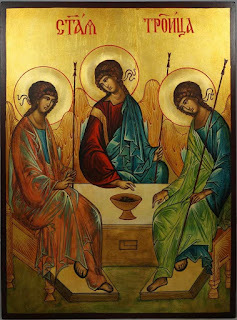 "Hospitality of Abraham" ("Holy Trinity"). Hand-painted icon by Andrei Rublev. In the Christian calendar, this is Trinity Sunday—the only Sunday in the church year dedicated to a doctrine of the church. For centuries Christians have sung, confessed our faith, prayed, baptized, received new members into our community in the name of a Trinitarian God who is traditionally Father, Son, and Holy Spirit. But for many Christians in our time (and for some in earlier times) the doctrine of the Trinity has been a problem. If you think about it, you can understand why our Muslim and Jewish friends have a problem with the Trinity and wonder if we really do worship one God. I agree that the Trinity is a mystery no one can fully understand. The doctrine of the Trinity reminds us that there is always more to God than we can conceive… always more of God than we can explain… always more than we can sing or preach or prove. So—what do we do with the Trinity? I think theology is important. I think bad theology can hurt people…and hurts the church. The language we use when we speak and sing of God is important. Apparently, some ordinary Christians in ancient times knew this. Theologian Elizabeth Johnson observes how fascinated people of the late fourth century were with speaking rightly about God. It’s difficult for many people today to grasp how bitterly this conflict divided the Christian world for several centuries. The Nicene Creed was hammered out to defend the faith tradition against the Arian claim that Christ was not eternal, but created. The Nicene Creed was the ancient church’s answer to the questions of its time, using the best philosophical constructs and language available to it at that time. We need to be clear with ourselves and in talking with others that we don’t “believe in” the Trinity. We believe in and trust in God, and the Trinity is a way Christians think about and speak of God. During times of controversy, the church has found it necessary to re-interpret the gospel for new times, in response to new situations and questions. If you look through our Book of Confessions, you’ll see that the “Scots Confession,” “the Heidelberg Catechism,” the “2nd Helvetic Confession,” and the “Westminster Confession” were worked out during the Reformation period, in response to concerns particular to that time. The 1960’s were turbulent times, and the “Confession of 1967” was adopted by the Presbyterian Church “to call the church to that unity in confession and mission which is required of disciples…” The theme of the Confession of 1967 was the church’s ministry of reconciliation, which has been a strong theme in the mission of this congregation for several decades. The Presbyterian Church had split at the time of the Civil War, over the issue of slavery, and it took over a hundred years for the northern and southern Presbyterian churches to be reunited. At the time of the reunion, the General Assembly voted to re-state the faith as a way of affirming what we believe together. The result was “A Brief Statement of Faith of 1991,” which we often say together in worship. The “Brief Statement of Faith” is a Trinitarian statement, which begins by stating that we trust in the one triune God, whom alone we worship and serve. The 2016 General Assembly made history by voting to add the “Belhar Confession” to our Book of Confessions. Belhar is a moving call for reconciliation and a condemnation of racial injustice written in South Africa during the struggle against Apartheid, to be a resource to the church during a time when racial tension, injustice and violence in the United States make headlines nearly every day. We are part of a living, growing tradition, and we continue to address new situations and questions by re-stating our faith. One of the great themes of our Reformed Tradition affirms the church reformed, always being reformed, according the Word of God, as led by the Holy Spirit. I believe that the controversies of our time over sexuality issues are finally being worked out after decades of conflict. I hope this frees us to work through other important questions for living faithfully in our time. For instance, how do we confess and live our faith in Jesus Christ in a pluralistic world? How do we speak of God in conversations with our neighbors who are Muslim, Jewish, Hindu, Buddhist, atheist, or “spiritual but not religious” or the “none’s” or “done's”? If we trust in a God who creates every person in the image of God, a God who calls us to love our neighbor and to live together in Beloved Community, what does our faith require of us in our relationships with those who are different and those who are marginalized? Jesus told his disciples that he still had many things to say to them, but that they weren’t ready to hear them yet. He promised that the Holy Spirit, the Spirit of Truth, would guide his followers into all the truth. But from the earliest centuries of the church, discerning theologians have stressed that all our language about God, including the Trinitarian symbols, are inadequate and relative. The Bible uses many images or metaphors for God, and other theologians have offered a number of possibilities for speaking of God. I believe God continues to speak a new word to us in new times--things we weren’t ready to hear before. We still have many things to learn, so we need to be learners--theologians. We need to listen for what God’s teaching Spirit has to say to us. In my study this week, I was reminded that the Western Church’s model of the Trinity has typically looked like a triangle, while the typical model in Eastern Orthodoxy is a circle. John of Damascus, a Greek theologian who lived in the seventh century, developed the understanding of the Trinity with a concept called perichoresis. I don’t bring a lot of Greek words into sermons, but this one gives us such a beautiful picture of God. “Peri”-- as in perimeter--means “around.” “Choresis literally means “dancing” -- as in choreography. This isn’t an approach to the Trinity that most of us in the Western part of the church are as familiar with, but some contemporary theologians, like Jürgen Moltmann and Mirosalav Volf, have written about it. Father Richard Rohr has written a very accessible book: “The Divine Dance: The Trinity and Your Transformation,” that invites us to take a closer look at the mystery of the Trinity. He says we need a larger God than the understanding that seems to dominate our culture. God is not what most people think. God is not an angry, distant moral scorekeeper or a supernatural Santa Claus handing out cosmic lottery tickets to those who attend the right church or say the right prayer. God isn’t a stern old man with a white-beard, ready and eager to assign condemnation and punishment. I find the metaphor of a dancing God beautiful and life-giving, and I think it is more faithful to the story of God’s self-giving love we hear in the scriptures. Imagine it: Father, Son, and Holy Spirit-- or Creator, Redeemer and Sustainer-- the three persons of the Trinity are like three dancers holding hands, dancing around together in harmonious, joyful freedom. In today’s Gospel lesson, we heard, “God did not send the Son into the world to condemn the world, but that the world might be saved through him.” God is not vengeful, not demanding of judgment or appeasement, not angry--but loving. The cross is a sign of just how far God will go to show us that God already loves us. How do we proclaim the good news of God’s love in our time? To those who have been baptized in the name of the Father and the Son and the Holy Spirit, we need to proclaim the new, open, love-filled space of our Triune God, the space where we are to love God with all we’ve got and to love our neighbors--all our neighbors-- like ourselves. Our God is a relational God, and the Trinity is all about relationship. I think the Trinity matters, because--without the Trinity, some people can make claims that justify the hatred of entire groups of people and call them animals. Without the Trinity, some churches will claim to be church but carry on with self-centered, individualistic, fear full messages, rather than a gospel of love and community. On this Trinity Sunday, what really matters is being led further into God’s truth and God’s way of love. Maybe, as Father Richard Rohr suggests, we need to push back the furniture a bit and make room to dance with the divine. Maybe that’s a better way to teach us all about God’s self-giving love and how we can be part of the dance-- God’s dance of love and life. The grace of the Lord Jesus Christ, the love of God, and the communion of the Holy Spirit be with all of you! Elizabeth A. Johnson, She Who Is: The Mystery of God in Feminist Theological Discourse. Shirley C. Guthrie, Christian Doctrine, Revised Edition (Westminster John Knox Press, 1994), p. 71. The Confession of 1967, article 9.05 in Book of Confessions of the Presbyterian Church (USA). See William C. Placher, Narratives of a Vulnerable God: Christ, Theology, and Scripture (Westminster John Knox Press, 1994). Richard Rohr, The Divine Dance: The Trinity and Your Transformation. (Society for Promoting Christian Knowledge / Whitaker House), 2016.